Welcome to Pinnacle Pets Training! 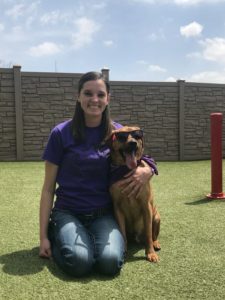 Our experienced trainer, Lindsay, is ready and happy to work with your pup on learning a variety of new commands, tricks, and eliminating any undesirable behaviors such as jumping, pulling on a leash, barking etc. Our trainer will work with your pup to create a strong bond of trust and respect through positive reinforcement. Owners interested in dog training will start with a 30- minute Training Evaluation with Lindsay, our Trainer, to create a program that will work best for you and your dog’s needs. This can be scheduled most days, but for best results, a regular training schedule is recommended. Our Board & Train option provides two 30-minute training sessions per day for a lesser rate than addon options for daycare/day boarding. Board & Train allows your pup to fully immerse in the training program, providing faster and more effective results. When they are not directly working with the trainer in one of their sessions per day, the staff working with them for regular boarding activities will be part of the training team and help reinforce the desired behaviors. You will receive nightly feedback with pictures/videos from our trainer to discuss each day’s achievements. The Board & Train program will include a 60-minute meeting with you at the end of their stay to go over their learned behaviors and how you can continue reinforcing what they learned, at home. We will continue communication for at least a few weeks to ensure everything is going smoothly and help troubleshoot any hurdles. Following a Board & Train program, you are also eligible for discounted rates on Private and Group lessons! Private Lessons are one-on-one sessions with you, your dog, and our trainer. We can work on a variety of different behaviors in lessons that are tailored specifically to your dog’s needs. Private Lessons are a great way to pinpoint specific areas of focus and help you continue teaching at home. Lessons last for one hour and are held every 1-2 weeks. Discounts on packages are available. We understand that some behaviors and reactions can’t be properly replicated at our facility. We now offer in-home training lessons to help you, and your family, fix troublesome behaviors and concerns right where they happen. Group Classes – Coming Soon! For more information regarding our training program, see our Frequently Asked Training Questions or contact us today!